GIRLS BASKETBALL: A 4-Peat for West Plains in The OC? WEST PLAINS—The road to an Ozark Conference title has gone through West Plains the last several years, and this year will be no different. Last year, West Plains posted a 21-6 record, but lost a district title game thriller to Republic by a single point, the second straight year those two teams have locked horns in a district title game nail biter. The Class 4 #5 Lady Zizzers graduated two starters, but return their top three scorers in senior All-Stater Cassidy Johnson, fellow classmate Kelli Bowen, and sophomore Payton Richards. 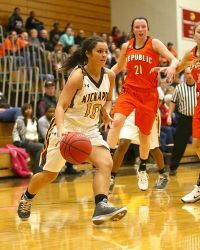 KICKAPOO—The Lady Chiefs return four starters from last year’s 18-10 team that posted a 7-2 mark in conference play. Kickapoo, which is currently ranked #2 in Class 5, features a deep and talented lineup, with returning senior starters Jordyn Danzer, Natalie Closser, Laura Vierkant and sophomore Jordan Sanders leading the way. The five-time state champion Lady Chiefs are a threat to end their season in Columbia once again. CAMDENTON—The Lady Lakers are coming off a share of Camdenton’s first-ever Ozark Conference championship, as the Lady Lakers posted a 7-2 conference record to tie West Plains at the top of the league standings. Camdenton finished just 14-10 overall, though, after a disappointing loss to Hickman in the district opener. Camdenton then lost Whitney Snow and two other seniors to graduation, but does have a pair of double figure scorers returning in juniors Bailey Rezabek and Sophia Shore. Fellow classmates Alyssa Ripley and Kendall Spraggins give the Lady Lakers a solid core of talented players. HILLCREST—The Lady Hornets return one of the area’s best all-around players in senior All-State guard Kelsie Cleeton, who teams with Kaycee Gerald to give Hillcrest one of the area’s best backcourts. The Lady Hornets finished at 18-8 a year ago, but enter this season with plenty of expectations, as evidenced by Hillcrest’s #4 state ranking in Class 4. Hillcrest also returns Lilly Beam and Kaelyn Cleeton, Kelsie’s twin sister. WAYNESVILLE—Do not let last year’s 11-14 record fool you, because Waynesville has one of the best lineups in the entire conference, led by a contender for Ozark Conference Player of the Year Kallie Bildner, who has already scored 30-plus points on two occasions this season. Bildner, a 2nd-Team All-State honoree a year ago, will draw constant double (and triple) teams, which will free up a host of talented shooters for open looks. Look for sophomores Nina Kizzee and Bree Stoddard to have breakout seasons for the Lady Tigers. LEBANON—Last year’s 12-14 season ended with a two-point loss to Washington in the district championship game, but with all five starters back this season, there is a lot of optimism around the Lady ‘Jacket program. Lebanon is ready to take the next step after playing in second-year head coach Brendan Kelley’s system for the first time a year ago. Sophomore point guard Kelsey Winfrey is one of the best players in the conference, while senior Maggie Vaughn (12 ppg) and junior forward Mikalyn Callahan (10.8 ppg) give Lebanon a solid nucleus. GLENDALE—This might be a rebuilding season for the Lady Falcons, and then again, it could be the start of something special. Glendale finished just under .500 at 12-13 last year, and then lost three starters to graduation. There are no seniors on the roster this season, though, as the Lady Falcons will be led by a quartet of juniors, including returning starters Mariah Starks and Teaira Clancy, as well as Keaira Clancy and Morgan Zimmerman. Longtime head coach Renee Temple knows how to get the best out of her players, so look for the Lady Falcons to surprise some teams this season. PARKVIEW—Last year was a season to remember for the Lady Vikings, as Parkview advanced to the Class 5 state quarterfinals before losing to eventual state champion Rock Bridge. Parkview finished at 19-11, which included a 6-3 mark in conference play. That’s the good news. The bad news is that the Lady Vikings lost four starters to graduation, none bigger than Ozark Conference Player of the Year Aubrey Buckley, a multi-year All-State selection who is now getting starter’s minutes at Missouri State. Senior Tyra Moore, the lone returning starter, is one of the top point guards in the area, but will be surrounded by a host of youthful Lady Viking newcomers. JOPLIN—After coaching the Joplin boys team the past five years, Jeff Williams will enter his first season at the helm of the Lady Eagles, who finished 9-16 last year (and 2-6 in the OC). Joplin graduated three seniors, but do return three starters in seniors Bailey Taylor and Samantha Stout, and sophomore Lexi Sohosky. The Lady Eagles will have more depth than they have had in years, and could go eight-deep on the bench for contributors. ROLLA—First-year head coach Luke Floyd lost four players to graduation from last year’s team that won just two games. Rolla returns three players that saw some starting time last year in seniors Roxanne Rafter and Caroline Victor, and sophomore Addy Brow. The Lady Bulldogs lack size and experience, and will look to compensate by forcing an up tempo game on their opponents. Kallie Bildner, Waynesville—Bildner was named 2nd-Team All-State by the media last year after averaging 22 points and 13 rebounds per game as a sophomore. The 6’2” junior, a 1st-Team All-Conference selection, has already scored a career high 38 points against Ritenour on Dec. 1, and dropped 33 points and grabbed 24 rebounds in a loss to Sullivan on Dec. 8. Kelli Bowen, West Plains—A 1st-Team All-Conference and All-District honoree laste year, Bowen averaged 10 points and five rebounds per game as a junior. The 5’9” senior is athletic and intelligent, and is a good complement to the Lady Zizzers’ All-State guard Cass Johnson. 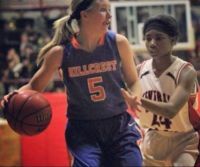 Kelsie Cleeton, Hillcrest—If it seems like Cleeton has been playing for Hillcrest forever, that’s because the senior has been making key contributions for the Lady Hornets since she first arrived at Hillcrest. The College of the Ozarks commit was an All-State honoree by the coaches last season after leading the Lady Hornets in scoring (20.6 points per game), rebounding (seven boards), assists (3.6) and steals (4.5). Cleeton, a perennial 1st-Team All-Conference honoree, already owns the career scoring and steals records at Hillcrest, and shot a blistering 48% from the field as a junior. Jordyn Danzer, Kickapoo—The Lady Chiefs are loaded for a deep state tourney run, but will only go as far as the talented Danzer leads them from her point guard spot. A great shooter and ball handler, Danzer has a high basketball IQ and regular y makes the smart play to set-up teammates for easy shots. The senior was honored as 1st-Team All-Ozark Conference and All-District as a junior after posting averages of 8.6 points, 2.4 assists and a pair of steals per game last season. Danzer’s biggest contributions, though, are often not seen on a stat sheet. Cassidy Johnson, West Plains—A legitimate contender for Ozark Conference Player of the Year, Johnson is the best player on what has been the conference’s best team the past three seasons. The 5’7” senior was named 1st-Team All-State by the coaches and the media a year ago after posting a team-leading 18 points per game. 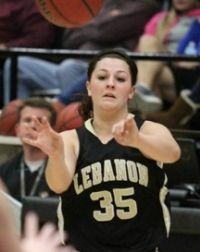 Johnson set two school records with a career high 44 points and 11 three-pointers in a win over Lebanon last February. The College of the Ozarks signee was a 1st-Team All-Conference honoree last year after making 64 three pointers on the season. Tyra Moore, Parkview—Graduation gutted the Parkview roster, leaving just one starter, but that lone returnee is a good one in Moore, a senior who averaged 14.3 points, 4.1 assists and a couple of steals per contest last year. The 1st-Team All-Conference and 1st-Team All-District point guard is cat quick and capable of getting to the rim or dishing to open teammates. Bailey Rezabek, Camdenton—A three-year starter at point guard for the Lady Lakers, Rezabek averaged 13 points and two steals per game as a sophomore. A two-year All-Conference and All-District selection, Rezabek will be looking to take another step forward after the loss of three seniors, including one of the conference’s best in Whitney Snow. If Camdenton is going to win another conference title this season, then Rezabek will need to lead the way. Jordan Sanders, Kickapoo—An All-Conference All-Defensive Team selection last year as a freshman, Sanders is a beast on the blocks for the Lady Chiefs. The 5’9” sophomore, who garnered honorable mention All-Conference recognition, is a powerful player who causes match-up problems with her strength and athleticism. Look for Sanders to increase her averages of 8.9 points and 3.5 rebounds per game from a year ago. 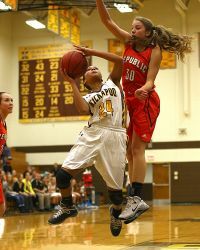 Laura Vierkant, Kickapoo—Did someone say the Lady Chiefs are loaded? 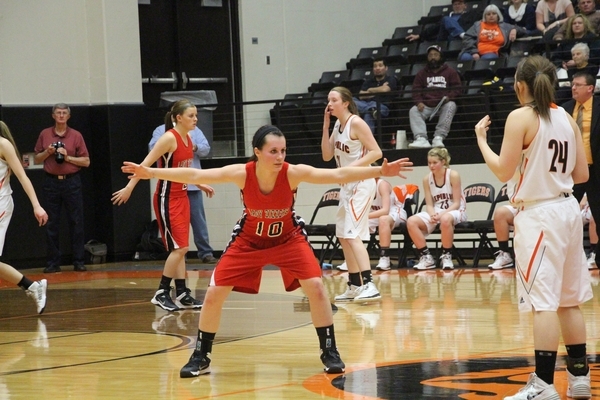 Vierkant led the Lady Chiefs in scoring last year as a sophomore at 11.2 points per game. The honorable mention All-Conference and All-District selection is a versatile senior who can play anywhere in the backcourt for the Lady Chiefs. Vierkant buried 42% of her three-pointers last season, and is also a great on-the-ball defender. Kelsey Winfrey, Lebanon—It is hard to excel as a freshman point guard, especially in the ultra-competitive Ozark Conference, but that is exactly what Winfrey did last season. 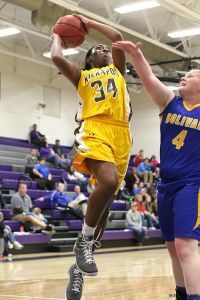 Winfrey, who gave a verbal commitment to Mizzou this fall, led the Lady ‘Jackets in multiple categories as a freshman last year, including scoring (15.8), rebounding (7.7), and steals (3.7). There is an unlimited ceiling for the only freshman named 1st-Team All-Conference last season. Mikalyn Callahan, Lebanon—Callahan averaged 10.8 points, 5.2 rebounds, 2.1 steals and a pair of assists per contest as a sophomore last year. Look for the junior forward to take a step forward and compete for 1st-Team honors. The key to the Lady ‘Jackets’ success this season may hinge on a player like Callahan stepping forward to take some heat off sophomore standout Kelsey Winfrey. Teaira Clancy, Glendale—The Lady Falcons will be young this season, with a junior-heavy lineup lewading the way. The best player on the Glendale roster may be Clancy, a speedy 5’3” junior guard who made the All-Conference Defensive Team a year ago. The point guard averaged 6.2 points, a team-leading 2.5 assists and 1.8 steals per game last year, but look for the numbers to increase this season. Natalie Closser, Kickapoo—Nagging injuries cost Closser much of her effectiveness during a difficult junior season last year. Now fully healthy, the talented Closser is ready to close out her career in style for the Lady Chiefs. The 5’11” senior post player averaged 7.3 points and 5.3 rebounds per game last year, numbers which are sure to increase with a full season of action. When healthy, Closser is a difference maker, and was a 1st-Team All-Conference selection as a sophomore. Kaycee Gerald, Hillcrest—Kelsie Cleeton gets a lot of the attention for her high-scoring exploits, but it’s Gerald who holds the key to Hillcrest’s success. The cat quick point guard is a lockdown defender who recorded 47 steals last year. Gerald averaged just 6.8 points last year, but between her defense and other little things that she contributes on the court, Gerald will play a major role in what happens this season for the state-ranked Lady Hornets. Payton Richards, West Plains—Richards started at point guard as a freshman for last year’s conference champions, earning honorable mention All-Conference and All-District honors. Big thing are expected once again for the Lady Zizzers, and Richards will be a big key to any success. The 5’7” sophomore averaged nine points, three rebounds and four assists per game a year ago. Sophia Shore, Camdenton—The Lady Lakers shared a conference title a year ago, but of Camdenton expects to hang another banner this season, then Shore will need to have another big season. The junior, who is a three-year starter, was an honorable mention All-Conference and All-District selection last season after averaging 13 points per contest. Mariah Starks, Glendale—The Lady Falcon junior brigade also includes Starks, who is one of two returning starters for Glendale. The athletic 5’8” forward averaged 6.4 points per game, a total which figures to increase with a more prominent role this season. The athletic Starks is a really good rebounder, and led the Lady Falcons in offensive boards a year ago. Bailey Taylor, Joplin—Taylor will be the Lady Eagles’ go-to player this season, and will be in position to increase her 14.7 points per game average. The talented senior, an honorable mention All-Conference honoree as a junior, will team with fellow classmate Samantha Stout to give Joplin a pair of experienced leaders both on and off the court. Maggie Vaughn, Lebanon—Vaughn quietly averaged 12 points per game as a junior last year, and will be counted on to knock down some shots to take some pressure off of sophomore standout Kelsey Winfrey. Vaughn has verbally committed to play next year at Missouri Valley College. (18) Nixa at Kickapoo—The Lady Eagles will bring a talented squad north to face Kickapoo, led by one of the area’s best players in senior All-State guard Toshua Leavitt. Both teams will be seeking a win before a lengthy break leading up to the Pink & White Tournament. (19) Hillcrest at Bolivar—The Lady Hornets pay a visit to the state’s third-ranked Class 4 team in a key non-conference match-up heading into Christmas break. Hillcrest’s Kelsie Cleeton will be the best player on the floor, but the Lady Liberators have plenty of talented players, including Randi Hancock at guard and Madison Campbell in the post. (26-31) Pink & White Tournament—Quite simply the best girls basketball tournament in the state (and arguably the entire region), the Pink & White Tournament once again features a loaded field stocked with reigning and former state champions, as well as standout players and coaches. The OC will be well represented in the weeklong tournament, as Camdenton, Glendale, Hillcrest, Kickapoo, Parkview, and West Plains will represent the conference at Drury. Other teams participating at the O’Reilly Family Events Center are Ash Grove, Aurora, Bolivar, Branson, Carl Junction, Central, Clever, Crane, Fair Grove, Greenwood, Hartville, Marionville, Marshfield, Mt. Vernon, Nixa, Ozark, Republic, Skyline, Spokane, Springfield Catholic, Stockton, and Strafford. (12) Camdenton at West Plains—These two teams shared an Ozark Conference championship last year, despite Camdenton’s 50-49 head-to-head win over the Lady Zizzers. Don’t think Cassidy Johnson and friends have forgot about that one! West Plains has won or shared three-straight conference titles, and a win over the Lady Lakers in the conference opener for both teams will point West Plains in the direction of a fourth-straight crown. However, the Lady Lakers have the talent to hand the Lady Zizzers a loss on their home floor. (12) Kickapoo at Hillcrest—Hillcrest has not beaten Kickapoo in what seems like forever. The Lady Hornets have come agonizingly close in recent years, including last year’s 74-69 overtime loss in which Hillcrest blew a 12-point third quarter lead. This will be the last opportunity for Hillcrest’s four seniors to beat their SPS rival. (19) West Plains at Kickapoo—Likely the Game of the Year in the Ozark Conference, these two conference heavyweights will clash on the Lady Chiefs’ home court. West Plains has won or shared the past three OC titles, but the Lady Chiefs are determined to win their first conference crown since 2011. The Lady Zizzers won a low scoring 29-24 game over Kickapoo last year. (2) Kickapoo at Camdenton—This could be a “trap” game for the Lady Chiefs, as they will be coming off a trip to the Kansas Army National Guard Invitational and a visit to Ozark, with games against SPS rivals Parkview and Glendale up next. The Lady Lakers have the talent to beat Kickapoo, and you can bet that Bailey Rezabek and Sophia Shore and company will be fired up for a visit from the Lady Chiefs. (2) Hillcrest at Buffalo—Watching Hillcrest’s Kelsie Cleeton go head-to-head with Buffalo senior standout Morgan Henderson will be well worth the drive to Dallas County. The team that emerges victorious in this one will likely get a big game from its “other” star player, such as Hillcrest’s Kaycee Gerald of Taylor Faulkner for the Lady Bison. (9) Glendale at Kickapoo—When these two arch-rivals hook up, it doesn’t really matter what kind of season either is having, because you can bet the farm you will get the best out of each player, which usually means a pretty good game. Last year, Glendale struggled to a 12-13 overall record, but the Lady Falcons’ season was made with a 51-46 upset of the Lady Chiefs, a loss which cost Kickapoo a share of the Ozark Conference championship. Do you think the Lady Chiefs have that one deposited in the memory bank? (16) Hillcrest at West Plains—Can the Lady Hornets spoil West Plains’ conference title plans? The Kelsie Cleeton-Cassidy Johnson match-up should be entertaining. Look for a player like the Lady Zizzers’ Kelli Bowen or Payton Richards or Hillcrest’s Kaycee Gerald, Lilly Beam or Kaelyn Cleeton to step forward and have a big game. (19) Camdenton at Hillcrest—Both of these teams believe they will be in the running for an Ozark Conference title this season. If things play out the way the Lady Lakers and Lady Hornets want them to then, this game could have major ramifications in determining a conference champion. Regardless, coaches all across the conference will be happy that Lady Hornet senior standout Kelsie Cleeton is playing her final Ozark Conference game. (19) Kickapoo at Waynesville—In the conference finale for both teams, the Lady Chiefs plan to be putting the finishing touches on their first conference championship since 2011. 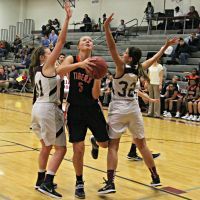 However, Waynesville is more than capable of spoiling those plans, and with a scoring machine like junior Kallie Bildner capable of dropping 30-plus on any given night, the Lady Tigers will be a tough out. (19) Lebanon at Parkview—With the Ozark Conference season drawing to a close, this would be a good opportunity to see two of the conference’s best point guards go head-to-head, as Parkview senior Tyra Moore leads the Lady Vikings against sophomore standout Kelsey Winfrey and the Lady ‘Jackets. (26) Bolivar at Kickapoo—With district tournaments looming across the state, the Lady Chiefs play host to Bolivar, which is currently ranked #3 in Class 4. The Lady Liberators are looking to make a deep state tournament run and should provide a good pre-district test for Kickapoo.